"Dr. Woolwine and his staff have great mannerisms about their work. They are patient, gentle and explanatory about the procedures performed. Professional and friendly at the same time. I changed dentists so that I could be his patient! Thank you to Dr. Woolwine and his amazing staff!" A Local Austinite - Dr. Mike Woolwine is a "true" native Austinite. He attended S.F. Austin High School and then went to the University of Texas. Staying true to form, he attended dental school at U.T. Health Science Center in San Antonio. After graduation, he and his wife, Cathy moved to Luling and set up a mom and pop dental office. After six years in Luling they had the opportunity to move back to Austin and they jumped at the opportunity! He has been practicing in the same building since 1985. He started out as an associate on the third floor and then set up his own practice in 1990 on the first floor, where he has been ever since. He and Cathy have two grown boys, Brad and Scott. Continuing Education - Dr. Woolwine has dedicated a lot of time and energy to continuing education, including several weeks spent at the prestigious Pankey Institute. The L.D. Pankey Institute has been dentistry's "one place" for postgraduate education that enables general dentist to take control and practice comprehensive, patient-centered dentistry. Pankey dentists understand the happiness and fulfillment to be had in closer relationships with their patients. 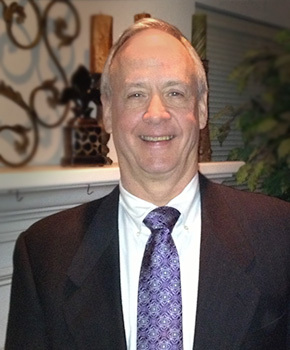 Dr. Woolwine is a member of the Capital Area Dental Society, Texas Dental Association, American Dental Association, and The Pankey Institute Alumni Association. Our Patients are Family - Dr. Woolwine truly enjoys the long relationships he has had with many of his patients. His patients have been seeing him since the early years of practice.